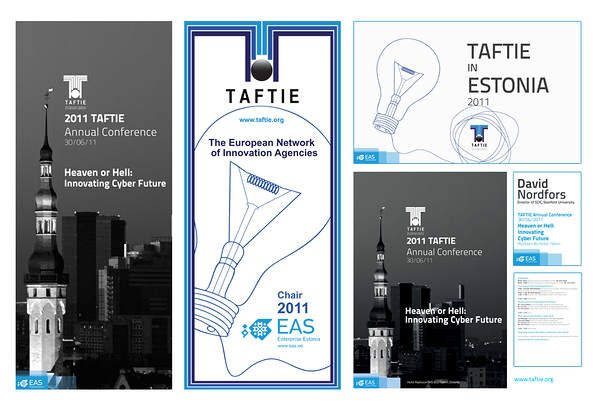 TAFTIE is the European Association of leading national innovation agencies. Its members make a major contribution to strengthen Europe’s economic performance by supporting product- process- and services innovation by implementing their countries’ national and -many times- international Research, Development and Innovation Programs. During the chair year Enterprise Estonia organized several events which were decorated with different commercials, rollups, posters etc. The main event of the year was TAFTIE Annual Conference, were we were included to organizing team as art directors. We made commercials and printings, also cooperating with RGB Baltic and Keha3 we decorated conference rooms with lights and sound systems.